When Is Someone Not “Properly” In Receipt of a Passported Benefit For Legal Aid Means Assessment Purposes? This question came up last week when I was going through the bank statement of a new client whom I proposed to advise and assist under the Legal Help Scheme. She was receiving Income Support and entitled to be treated as receiving a passported benefit for Legal Aid purposes. What worried me when going through the bank statement was that whilst there was clear evidence of payment in of Income Support there were other payments in such as child support and some other payments. I was not sure how high the level of this additional income would have to be before somebody at the Legal Aid Agency might refuse payment for the work on this case because I was said to have failed to adequately consider whether the client was property in receipt of Income Support. The passporting benefit must be currently in payment (e.g. the individual will not be passported if the benefit claim is still being processed or if payments are suspended pending a fraud investigation) and the individual must be legally entitled to the payment. If the passporting benefit is in payment but there is a suspicion that an individual may not be “properly” in receipt—e.g. representations have been made against the individual’s means or the individual’s own declarations have indicated that relevant facts such as a partner, employment, sources of income and capital etc. have not been advised to the benefit office—their legal aid claim will not be passported. The answer would therefore appear to be whether the information provided by the client gives rise to a suspicion that they are not entitled to the passported benefit which they are receiving. Following the withdrawal of Legal Aid for Welfare Benefits work the Legal Aid Agency can not expect most of us to have a specialist eye for possible non entitlement. I think therefore that as long was we can record that we have no suspicion that the information provided by the client means that they are not entitled to the passported benefit which they are receiving we should not be at risk of not getting paid. The client’s net income for the month up to the date when they sign the Legal Help is more than the net income limit for non passported benefits – ie £733.00. The client’s wages are more than the Universal Credit Work Allowances. This is not meant to be definitive advice on this question. I would welcome any comments on here or by email to wflack63@gmail.com If anyone would like to correct what I have said or add to it. This entry was posted in Uncategorized on October 29, 2018 by William Flack. I have had a list of solicitors which I give to people whose cases I can’t take for a while. I have now put it on the site . You can access it via the link at the top of the page. I hope to add to the list so please let me know the contact details of anyone you think should be added. I can amend the list to include organisations outside London if I get the details. At the bottom of the page is a link to the list as a Google Document which you should be able to print or copy. Please let me know if you can’t. This entry was posted in Uncategorized on October 12, 2018 by William Flack. Two weeks ago I posted what I thought was the good news that the Legal Aid Agency had reinstated devolved powers for solicitors to grant Emergency Legal Funding Certificates for Judicial Reviews involving homelessness children under the Children Act 1989. It turns out that this was not correct. I was confident that devolved powers had been reinstated for Children Act cases because a member of staff at the Legal Aid Agency had telephoned me and told me that they had. This was in response to an application which I had made for the Legal Aid Agency to grant an Emergency Legal Funding Certificate. This was for a child who was sleeping on the floor of a living room with a sibling and his mother. They had all been asked to leave but they were not at risk of being put out on the street within the next 48 hours. On these facts I was advised by the caller from the Legal Aid Agency that I would be able to grant an Emergency Legal Funding Certificate myself. I passed this information on through my post. Soon after sending out my post I received a message from the Housing Law Practitioners Association (HLPA) pointing out that although the Legal Aid Agency had stated that devolved powers had been restored they had also set conditions for exercising those powers which means that in many if not most cases it would not be possible to exercise them. These conditions can be found in the tables of delegated functions published by the Legal Aid Agency. 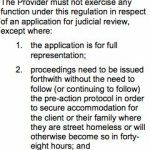 These included The Civil Legal Aid Procedure Regulations September 2018 which stated that Emergency Legal Funding Certificates could only be granted where the child was street homeless or at risk of street homelessness within 48 hours. The actual wording is at the bottom of page 8. Here is a screenshot. This condition means that unless the child is on the street already or will be in 48 hours a solicitor cannot grant an Emergency Legal Funding Certificate. This will cause problems where the child is in highly unsuitable accommodation but is not on the street, or as in my case where they have been asked to leave but the person who they are staying with has agreed to allow them to stay with them whilst proceedings are issued. The HLPA message went on to point out that another table Civil Legal Aid Financial Resources September 2018 stated that devolved powers could only be issued where the client was in receipt of a passported benefit and had savings of less than £2,000.00. As far as I am aware children cannot claim passported benefits which means that according to this rule it will not be possible to for solicitors to grant Emergency Legal Funding Certificates for any children under devolved powers even if they are street homeless or threatened with street homelessness within the next 48 hours. It won’t be a problem if the client is the parent and they are receiving a passported benefit. This will of course exclude all adults with no recourse to public funds who will also be unable to claim a passported benefit. The HLPA message stated that the above issues had been raised with the Legal Aid Agency and that clarification would hopefully be provided soon. I also telephoned the Legal Aid Agency last Wednesday and asked if somebody could ask the person who called me to check the above points and let me know if they would still advise me that I should have used devolved powers. I was able to speak to a senior case worker but not to the person who called me. I was told that I would be contacted with an answer. I had not received one by the end of the week. I hope that the Legal Aid Agency will correct what I also hope will be recognised as errors in the above tables so that solicitors can exercise devolved powers again in respect of Children Act Judicial Reviews. In the meantime the risk of not being paid for the work carried out means that it will be wiser for solicitors to ignore my earlier post and not grant Emergency Legal Funding Certificates ourselves but to ask the Legal Aid Agency do to do. This entry was posted in Children Act, Legal aid on October 6, 2018 by William Flack. This may seem like common sense to most experienced legal case workers but I was asked the same question last week by two different people who were new to this line of work. I have therefore turned my answer into a post in case there are more people out there wondering about this issue. The simple answer to the question is “No. Don’t just leave things.”. The longer answer is that you need to take steps to ensure that you can demonstrate that you have tried to contact the client; you have warned them that their case will be closed if you do not hear from them and that you have notified them that you are taking no further action. If you do not do this you are at risk of the client re-appearing in the future complaining that they thought you were supposed to be helping them and its your fault that they have been evicted or whatever it is that has happened to them. The worst example of this is the call from the client at Court just before a hearing is about to start asking why nobody is there to represent them. If you protest at that stage that you did not know about the hearing because they had not been in touch there is a risk that they will say that they assumed you had also received notice of the hearing and were dealing with it. If they complain about you not having worked on their case after they disappeared the person dealing with the complaint will ask you for the evidence that you told them that you were not helping them. If you don’t have this there is a risk that you will be found to be at fault. To avoid this I suggest that you take the following four steps. ** Note ** I refer to sending letters in the steps below. If you have an email address for the client you might just want to send emails. I suggest that to be on the safe side you send a letter in the post and send a copy by email as well. I also suggest that you send a text message at each step as well. I have created template text or the letters and text messages which can be found accessed via this link. You should send the client a letter asking them to contact you and provide instructions. Diarise a date for 14 days later (or sooner depending on the urgency) to review the case so as to to move on to Step 2 if there is no response. You should send a further letter enclosing or forwarding the first letter and asking the client to provide the instructions requested. Another text message should also be sent. Set another diary date for Step 3. If you have still received no response send a further letter enclosing the first letter and referring to that and the reminder and repeat the request for instructions. This time include a paragraph stating that if you do not hear from the client after 7 days you will close their file on the basis that they no longer require instructions and that you trust this is agreeable to them. If you are on the record as acting for them warn them that you will notify the Court and any other parties that you are no longer representing them. If they have a Legal Funding Certificate state that you will be asking the Legal Aid Agency to cancel their Legal Funding Certificate. A further text message should also be sent. Even though you gave them 7 days you should normally set diary 14 days if the matter is not urgency then move on to…. Send a final letter advising the client that you have closed your file and that you will be taking no further action in relation to their case. If you follow these steps you should be ok. You will can rely on your copies of the letters which you have sent as showing that you had taken all reasonable steps to notify the client that you were closing their file and not working on their case. A slight variant of the above scenario is where you have agreed to help a potential client but you have asked them to take steps such as providing you with documents or proof of Legal Aid eligibility before you actually open a file. In situation you do not have a File or Case to close. You might not even think of them as your client yet. Nevertheless the potential client may not realise this so it is best to follow a shorter procedure for that they are not left in any doubt. I suggest that a letter is sent confirming the request for instructions and/or information and stating you will not be able to take on their case without this. If they have not responded within a week a further letter should be sent advising that you are not taking the case on. This entry was posted in Client Care on September 30, 2018 by William Flack. 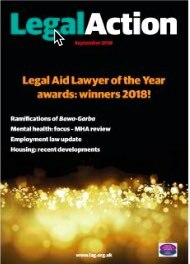 This month’s Legal Action magazine reports on two instances of the Legal Aid Agency getting things spectacularly wrong as a result of its staff not knowing what they were doing. The first concerned the way in which the Legal Aid Agency mismanaged the provision of Legal Aid to South West London Law Centres in representing Wendy Lomax in challenging the unlawful failure of Gosport BC to recognise that she was entitled to be treated as homeless for the purposes Part 7 of the Housing Act 1996. The second was the decision to cut the number of supplies able to work on the Duty Solicitor service for housing at the County Courts which led to the Legal Aid Agency losing a Judicial Review. I only have space here to talk about the first case. I would like to come back to the Duty Rota issue another time. The Court of Appeal Judgment in the Lomax case has been widely reported as a very important decision on the issue of when somebody is entitled to be treated as homeless because their home is not reasonable for them to continue to occupy. Here is a link to the Nearly Legal post on the case. As a result of errors on the part of the Legal Aid Agency the case was nearly prevented from reaching the Court of Appeal. Wrongly refusing the application because permission to appeal had not been applied for in the County Court. Wrongly refusing to consider the amendment without a transcript of the judgment. The Law Centre did not have the funding in place (because the Legal Funding Certificate had not been amended) to pay for the transcript and did not have time to apply for it. Wrongly deciding that Ms Lomax did not have a good prospect of success. A specialist barrister had advised that she did have a good prospect. This was simply ignored until the Law Centre were able to appeal to an independent decision maker. By then though the 21 day time limit for appealing had expired. Had the Law Centre not taken the risk of issuing the appeal without waiting for the Legal Aid Agency to amend the Legal Funding Certificate Ms Lomax might not have been able to pursue her appeal. These errors arose against a background of a member of the public living in Dorset having to instruct a solicitor based in London due to the lack of local solicitors who could deal with the case. The Legal Aid Agency cannot be blamed for the cuts in Legal Aid which are the primary cause of the shortage of available specialist solicitors but they are in my opinion responsible for making things worse by operating in a hostile and ill informed manner. This approach leaves the Legal Aid Agency unable to recognise the errors which they make and to improve the service which they provide. The scale of the problem at the Legal Aid Agency can be seen from their response to this story which is also quoted in the Legal Action article. I set it out here in full. This obvious nonsense is attributed to the anonymous Legal Aid Agency spokesperson who we usually find putting in an appearance at the end of articles like this reporting Legal Aid Agency failings. The response is nonsense because Legal Aid is not available right across the country. There are large areas such as where Ms Lomax lived where there are no solicitors available to take on a case like hers. It is of course imperative that those entitled to Legal Aid have access but the whole point here is that Ms Lomax did not have access at a critical point in her case because staff at the Legal Aid Agency wrongly refused her Legal Aid funding which she was entitled to. It is not clear from the quote whether the Legal Aid Agency have actually carried out a review of what took place in this particular case. If they did they have kept the outcome of the review and the way in which they have addressed the issues arising to themselves. The fact that the Legal Aid Agency can come up with such an inappropriate response can only mean that problems of this kind are likely to continue. What should happen in a case like this is that a named official from the Legal Aid Agency should publicly apologise for the service provided, and explain how the errors were made. They should outline what steps will be taken to prevent errors of this kind happening again and identify who will be responsible for ensuring that those steps are taken. Recognising and taking ownership of errors is a first step towards ensuring that they are not repeated. This entry was posted in Legal aid, Uncategorized and tagged Legal Aid on September 25, 2018 by William Flack. 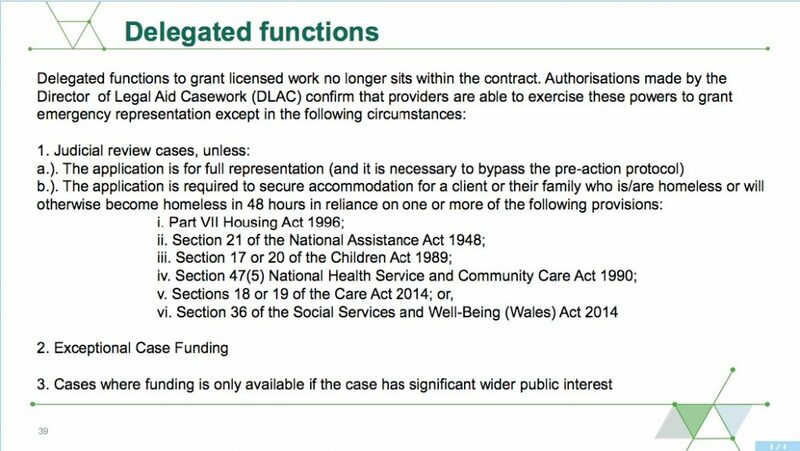 It looks as though the new 2018 Legal Aid Civil Contract has reinstated delegated powers so as to enable solicitors to grant Emergency Legal Funding Certificates for homeless clients who need to issue Judicial Review proceedings involving just Section 17 of the Children Act 1989. I just found this out today after I submitted a non delegated functions application for a Legal Funding Certificate to cover a Judicial Review for a homeless child involving Section 17 of Children Act 1989 and was advised by the case worker that I could have granted the Emergency Legal Funding Certificate myself. 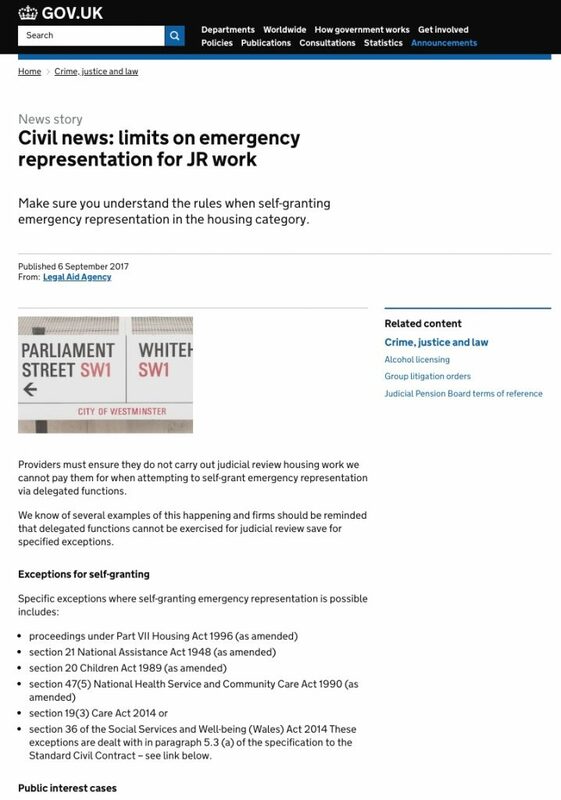 When I said that my understanding was that Section 17 was excluded from Judicial Review delegated functions the case worker emailed me the following text which he said was copied from a list instances where solicitors can grant Emergency Legal Funding Certificates under devolved powers. I asked for a copy of the document which this was taken from but was told that it was just from an internal Legal Aid Agency document which could not be disclosed. I have done some digging around and have found the same list on the slide below produced by the Legal Aid Agency for Training on the 2018 Civil Contract. This is page 39. The full set of 43 slides can be found here. The list looks like an amended version of this older list published in 2017 so that Section 17 now appears where only Section 20 of Children Act 1989 previously appeared at the third bullet point. Here is a link to the actual site. I have included a copy in case the site is replaced soon. This change is very helpful to people like me who often have to obtain Legal Funding Certificates to cover Judicial Reviews concerning just Section 17 of the Children Act 1989. Not being able to grant Emergency Legal Funding Certificates myself meant that I was delayed in taking urgent action by having to wait for someone at the Legal Aid Agency to consider my application. To be fair the staff at the Legal Aid Agency have usually been very quick to deal with them but it is a problem if work needs to be started at 5:30pm and it is not possible to contact the Legal Aid Agency. I have not been able to find a specific Legal Aid document other than the training slide which says that delegated powers are available again for this work. If anyone else has found any such documents please send them to me at wflack63@gmail.com. I suggest that people check with their Contract Managers before starting to use delegated powers again so as to be on the safe side. I would very much appreciate any comments people have about this especially if anyone out there thinks I am wrong and that solicitors using delegated powers for Section 17 Judicial Reviews will still be at risk of not getting paid. This entry was posted in Legal aid on September 20, 2018 by William Flack. Here is a very valuable document for anyone who like me regularly issues homelessness appeals in the Central London County Court pursuant to Section 204 of the Housing Act 1996. 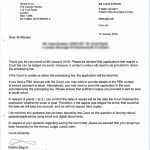 For years I have had to worry about ensuring that hard copies of the Court papers were received at the Court within 21 days of the date when the Section 202 Review decision letter was received. That now appears to be a thing of the past. Here is the letter as a PDF. I am extremely grateful to Mrs Begum at the Court for providing a very detailed response to my queries about whether Appellant Notices and supporting documents can be sent to the Court by email as PDFs or whether it is still necessary for hard copies to be sent to the Court. 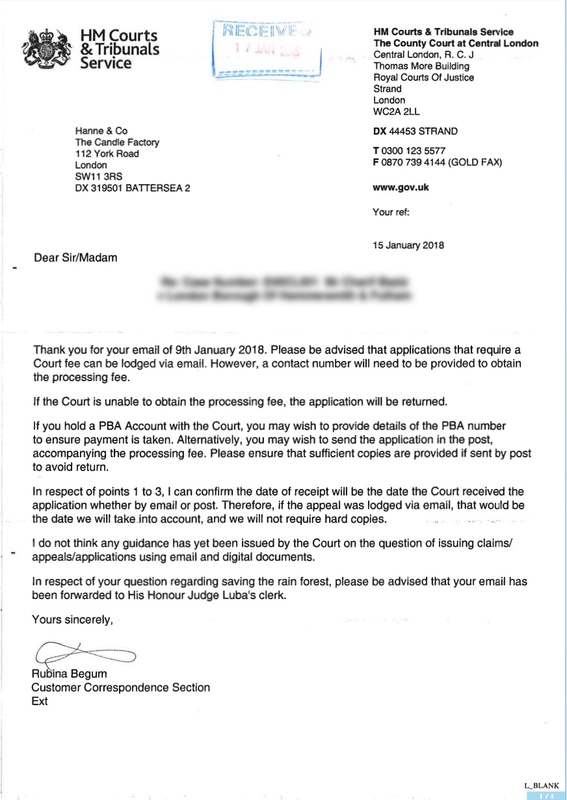 As can be seen from her letter of 15 January, the answer is that they can as long as you have a PBA Account with HM Courts & Tribunal Service for paying the fee. So far there has only been limited guidance available from the Courts as to what can and can’t be issued digitally. Please leave a comment if you are aware of any other guidance. All I had been able to find was the Courts Email Guidance. The attached letter was sent after I had to complain after Central London County Court initially accepted and then sent back an Appeal which I had issued by sending papers by email only. I had been sending Application Notice in this way and having them issued without problems.. My complaint led to the Court agreeing to issue my appeal. As part of the complaint I asked for clarification of the Court’s approach. When I wrote to the Court I referred them to the Bryan McGuire QC memorial lecture on homelessness given by HHJ Jan Luba QC in April 2017 (Link here) which set out at paragraph 111 a number of very useful Pointers For Appellants. These included a request to cut down on paper work and help save the rain forests. I asked for guidance on those like me who act for appellants might take up the call. I have had a further response from HHJ Luba QC in which he reminds me that Ms Begum as a court official should not be treated as stating what the actual Court procedure is but only as setting her understanding of it. He also suggested that at some point in the future the Courts will be accepting Appeal Bundles in digital format. I think that they should have started doing this some years ago but I am very glad that they are at least allowing us to issue by email. I also attach a copy of a letter dated 15 January 2018 from Ms Begum at Central London County Court confirming that Homelessness Appeals such as this can be issued by email without the need for hard copy documents to be sent. Please can you issue the Appeal and place the papers before a Judge so that consideration can be made to issuing directions for the preparation of the case for hearing. Please can you send me notice of issue, hearing date and the directions Order or advise as to any reason why you are unable to do so. Please do not hesitate to telephone me should you wish to discuss the above. Apart form an automatic acknowledgement email I have not heard back from the Court yet. I will update this post once I do. This entry was posted in Uncategorized on February 3, 2018 by William Flack. For some time now I have been using a Google Sheet which I created to enable me to quickly calculate whether people might be financially eligible for civil Legal Aid. It is a lot quicker than than trying to work it out with a calculator or by logging onto the the on line versions. I thought it I would share it online so other people could use it. Here is a link The link does not seem to work on mobile devices at the moment but works on my laptop. I have included at the end of the sheet the figures from the Legal Aid Agency Key Card and the current Child Benefit rates. I have had to use the April 2015 because I could not find one for April 2016. If anyone has the 2016 Key Card please let me have a copy. If you prefer a slower but more reliable calculator which the Legal Aid Agency are more likely to treat as proof that financial eligibility was properly calculated then you should use the Legal Aid Agency’s own calculator. Any feedback would be appreciated. Please let me know if you spot any errors or can see ways in which the Sheet can be improved. Please do not rely on the calculator as providing definitive proof of financial eligibility it is just meant to assist people carrying out the sums. This entry was posted in Legal aid on May 22, 2016 by William Flack. Part 3 of The Immigration Act 2014 is likely to come into force nationally shortly following a 6 month pilot in the West Midlands. I won’t go into detail about the Act here. Further information can be obtained from blog posts by Nearly Legal – Tessa Shepperson – Trisan Hyatt at Invictus Chambers and from the You.Gov website. In a nutshell, the Act provides that landlords who rent properties to tenants who do not have leave to enter or remain in the UK will be liable to be fined. This is designed to stop private landlords from renting properties to anyone who cannot show that are entitled to be in the UK. As with previous initiatives to make like difficult for migrants this Act is likely to add to the existing burden on local authority Social Services Departments in providing assistance to those poorest members of society who are excluded from mainstream benefits and services. It will once again fall to Social Services staff to prevent people who have children with them or have special needs from becoming street homeless. This is because Schedule 3 of the Act excludes certain tenancy agreements from those which cannot be let to persons without leave to enter remain. These include accommodation provided by local authorities. (b) which is not excluded by another provision of this Schedule. (c) in relation to Northern Ireland, Article 3 of the Housing (Northern Ireland) Order 1988 (S.I. 1988/1990 (N.I. 23)). This is going to mean that overstayers or other persons who are not able to obtain private sector accommodation directly from private landlords or letting agencies and are facing street homeless are going to have to apply to Social Services for assistance. This is of course already happening where the persons not have enough money to obtain or keep a private tenancy. To these persons there will now be added those who would have been able to afford to pay for private accommodation but cannot find a landlord who is willing to take them on because of the new Act. I say that it will be Social Services who have to do the work because staff in Housing Departments are generally able to refuse to provide any assistance where the applicant is not “eligible” for housing due their immigration status pursuant to Section 185 of the Housing Act 1996. Unlike their colleagues in the Housing Department, the staff in the Social Services Department must assist these applicants even if they are excluded from receiving assistance under Schedule 3 of the Nationality, Immigration and Asylum Act 2002 where a breach of their human rights would arise if assistance was withheld. Those who might have been housed under Part 7 of the Housing Act 1996 because they have children living them will be seeking accommodation by way of assistance under Children Act 1989 and those who would have been housed due to medical conditions rendering them vulnerable would be asking for accommodation under the Care Act 2014. Social Services Departments in many London Boroughs have already had to set up No Recourse To Public Funds teams to deal with persons facing destitution because their immigration status prevents them from receiving mainstream housing and benefits. They have to try and find housing for those applicants whom they are not able to turn away in the same way that the Housing Department can. This already places a considerable strain on staff who only have limited resources and are unlikely to have very much housing training. Although it is common for Social Services Departments or Legal Departments to write to me saying that Social Services are not “quasi letting agency” the Immigration Act 2014 takes them another step along the way to becoming just that. Social Services Department staff will soon face further demands for assistance from people whose only needs are housing related in that they cannot obtain private sector tenancies or social housing. Staff will have to find landlords for these persons and arrange for a tenancy to be granted for them in a way that brings it within Paragraph 7 of Schedule 3 of the new Act. If they are able to do so they will be acting as a filter which negates the effect of the Immigration Act 2014 by bringing the new tenancy agreement within the class of excluded agreements set out in Schedule 3 and allowing the landlord to grant a tenancy to the person because it is now provided as a consequence of a duty or power imposed or conferred upon a local authority. Alternatively, if a private landlord cannot be found they are going to have to house the applicants themselves. 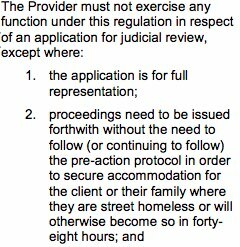 A practical step for Social Services staff might be to provide homeless persons without leave to remain who can find landlords with a letter indicating that the council will be able to assist in endorsing a request for the tenancy if necessary if the landlord were minded to grant it but for the risk of a fine under the Immigration Act 2014. Having said that it is likely that by breaking cover and having to reveal their immigration status in order to avoid homelessness an overstayer would become known to the authorities and have to stop working pending the outcome of an application for leave to remain in the UK. This is likely to cut off their income and stop them from being able to afford to pay for private accommodation themselves. As such they will be added to the large group of people facing destitution without assistance and funding from Social Services. This entry was posted in Uncategorized on June 28, 2015 by William Flack.